M-Audio has made a great product even better and reduced the price. Fast boot up. No excessive menu lists. Quality sound capture. The original MicroTrack offered plenty of features and enabled you to record at 24-bit/96kHz quality. M-Audio has now updated this very useful gizmo while also bringing down the basic retail price. Despite a new dark grey/black colour scheme there is very little cosmetic change. The display is the same backlit LCD and the controls are all in the same places. This is apart from the original 3-way gain range switch has now been replaced by a 3-way display brightness control. Though this is not an essential feature it is useful. The lack of a gain range switch isn't a problem because the input ampliﬁcation system has been changed to an auto switching design, cutting out one more step in the process of setting that all important recording level. The other changes that have been made all lie inside the operating and ﬁle management system. Firstly, to take advantage of the recent jumps in CompactFlash and Microdrive capacities, the MicroTrack II overcomes the 2GB ﬁle limit of FAT32 by splitting recorded ﬁles to maximise recording times. This is a useful feature for anyone who wants to record long live performances or conferences. In fact, an 8GB CF card will provide just over four hours recording at 24-bit/96kHz. To help with later editing of such massive ﬁles, a marker drop option has been added in the Broadcast WAV format (BWF). Beyond these few changes the overall simplicity of the original model has been maintained. The simplified input gain setting further decreases the time between turning the unit on and getting down to recording a decent level, and we're relieved that the T-shaped mini stereo mic supplied with the original model is still included. 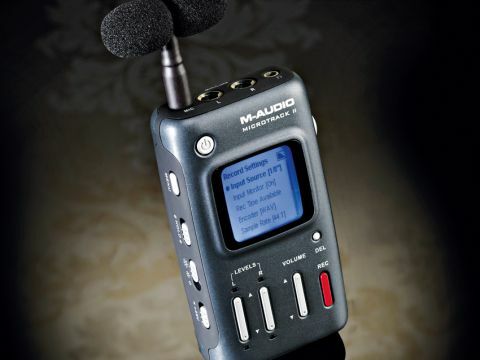 It deliver a clear, flat sound and means you can get your recording work started straight out of the box. If you prefer your own mics, there are two inputs on TRS jacks with switchable +48v phantom power. Though the preamps in a unit this small are hardly going to set your ears alight, the amplification is clear, relatively flat across the audio spectrum, not too noisy, and offers enough gain for all but the quietest of sources. We're glad that M-Audio hasn't had to compromise the MircoTrack II's functionality in order to get the price down. The rechargeable internal battery and combined USB/power supply system really help this product, and it would have been horrible to see them replaced by a battery bay and separate PSU. Though the excellent sound quality of this unit more than justifies its cost, we feel its real strength is the simplicity of the operating system and rapid speed at which it boots up. Many other recorders have massive lists of useless menu options and can take an eternity to boot up - annoying when you're trying to capture a 'once only' sound in the field. So, whether you're recording live gigs off the mixing desk, capturing interview material or simply sampling the outside world, the MicroTrack II is a quality solution at a great price - get one.